Much has happened over time at this address, at these addresses, at this location, this building, this structure. Sure, there can be a slight sense of dislocation along any given stretch of street as odd numbers are skipped on the even side of the block, and vice versa on the opposing — how the resulting rough congruences leave open potential voids, missing numbers, interstitial spaces that prove, upon investigation, either purely hypothetical or hidden in plain sight. But this multi-residence doorbell is something else entirely. Here there is a 1236, and then a 1238A, and also something missing, something forgotten, something erased. Where, to begin with, is the 1238 whose former presence required the “A” to be appended to a separate unit? What was the room to the right of 1236, a space now taped over, not just the label but the button itself? What’s the extra bit of tape above 1236 — what information did it exhibit? 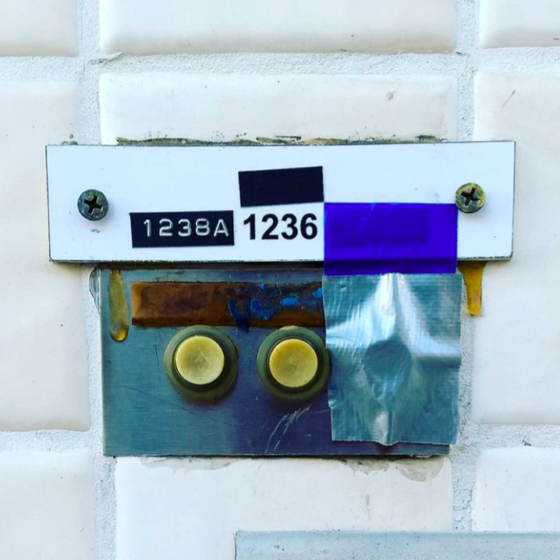 Why did 1238A get added on later, using embossed label tape, rather than appear as part of the original doorbell? And finally, what is referenced by the blue tape residue atop the brown metal strip above the buttons? Was there some previous configuration? In any case, at some point do let the myriad inherent questions recede and take some pleasure in the happenstance construction of the object itself. Blow up the image, marvel at the various textures, and revel at the readymade, Robert Rauschenberg-seeming piece that the world — which is to say: lack of care, combined with time, combined with a need to solve some now deeply obscured problems — has served up.